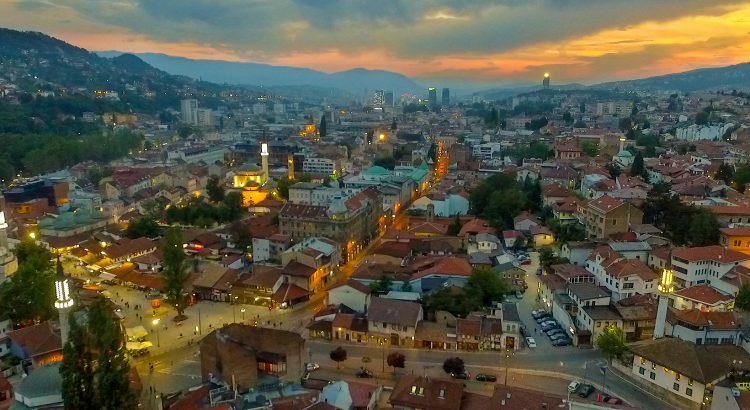 Mid Ramadan this year (2017) I took my kid and his friend after their German class to the medieval, Ottoman fortress right above the old town of Sarajevo. There’s this hundreds of years old tradition in Sarajevo of firing cannons at the fast breaking time, and we can hear those cannons at our home, but can’t really see them at all. He really badly wanted to see the cannon and watch being fired from at iftar (fast breaking) time. We drove up to the fortress towers one of the cannons is located at and barely were able to park the car. Upon entering the tower I was amazed with how many people were there. Some of them came to the small restaurant atop the tower and ordered their fast breaking meals, some of them brought their own food and were trying to find a vacant table or simply sat on the grass, while we were there only for the cannon shot, and planned to go back home immediately after the cannon was fired. Kids were completely into playing and in their own world, and since I had my drone in the trunk, I decided to shoot a little bit. Had the drone fired up, and draw all the attention to myself, and people started asking if they can take a picture or a video of the drone (I don’t understand it either :D) . As the iftar time was getting close people were turning to their own business (impatiently waiting to gulp cold water and put some food in their mouths after the whole hot, summer, June day of complete abstinence from food and drinks, and hopefully bad deeds). I was finally able to relax a little and concentrate solely on my drone and taking all the shots I wanted, for about 30 seconds. As it usually happens, my kid came and informed me that he needs to pee, badly. I handed over the remote control to a guy I just met, but who was also into aerial imaging and has drone very similar to mine, and asked him to do few more passes while I take the kid to the, as it turned out nonexistent, toilet. He graciously said yes, and after we came back I landed the drone and went home. Regardless of my best intentions to cut the video the very next day, I did that only this morning. It’s already a week past Ramadan, but I still wanted to share some of the shots with you. It’s not much, I’d love if I had filmed more, especially details and maybe people eating, but I did not. This will do, I hope.